Sometimes, buying a stroller is like the proverbial Chinese food meal where you are hungry an hour later. Soon after I buy a new stroller, I find myself wanting to buy another one... craving features and functions that my new stroller doesn't have. This is how I wound up with two triple strollers. for the perfect way to transport 3 small children, I found a great deal on a used Valco Baby Double Trimode with the 'Joey seat' to make it a triple. 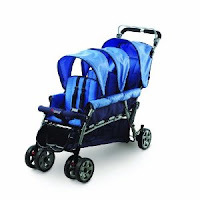 This stroller is sturdy and maneuverable with deep reclining seats for little ones to lay flat and sleep comfortably. The third seat is strong enough for a 20 kilo toddler although I wasn't so happy with how exposed the child in the third seat was. It is possible to buy a Valco Baby Joey sunshade for it...or buy a sunhat for your child. Like many larger-sized strollers out there, the Trimode has nice big tires...filled with air!!! After several punctures, I had the guy at the bicycle store fill the tube with puncture-resistant stuff ('chomer') and put a rubber liner ('goomi') between the inner tube and the tire and I never got punctures again. At the time that I bought my stroller, I overlooked the fact that this was a very difficult stroller to fold. 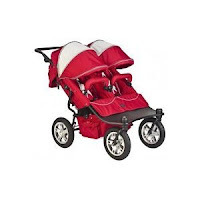 And not so long afterwards, I realized that I really really wanted a triple stroller that folded easily. To transport the Trimode, you have to remove the third seat, which is clamped onto the stroller quite strongly. (but remember.. you want it to be clamped securely so your 20 kilo toddler won't fall out of it) After the seat is removed, the stroller folds in half. If you were always travelling with a partner, it would be OK-ish to do this every time. 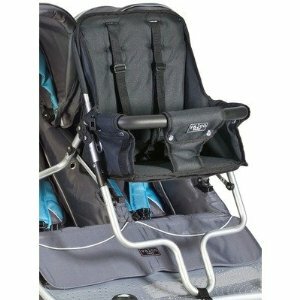 If you are a lone mom with three small children and you need to fold up your stroller to put it under a bus, you will need something that folds quickly and easily. 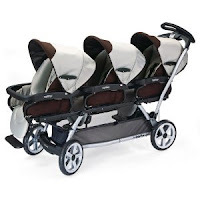 For me, the answer was the Trio Tandem stroller from Foundations. Foundations is a company you have likely never heard of...they make cribs and strollers for day cares and hotels. Their strollers are basic; they only come in one color (blue!) and don't give you gadgets or cool features *BUT* they sold me one with their great prices and the fact that their triple and quad strollers fold so easily. So yes, my brother schlepped my new triple stroller halfway across the world. I love this stroller because I did not have a problem collapsing this stroller, locking it in place and hoisting it into the 'baggage' of an Egged bus. I also love that is costs $369. This is an ideal stroller for me, since my youngest is over a year old. This would not be a good stroller for mom with a newborn...the last seat reclines to some degree, but not enough to accommodate an infant who can't sit up. Also, there is no way to attach a carseat or a bassinette. As expected, the Trio was long and takes some strength to steer... after all, it is a triple stroller. The stroller itself is relatively light, but if I had an option to redesign it, I would add a steering wheel like the Peg Perego Triplette which, incidentally, is an ideal stroller for newborn triplets. The seats, sunshades, etc. on the Trio are sufficient for their purpose, but nothing special. If you are considering the triple Foundations stroller, be warned that it has a certain safety feature that you will find positively infuriating...until you permanently disable it. To prevent it from rolling away, they have installed a safety bar right beside the handlebar. Unless you are squeezing the safety bar, the brakes on the rear wheels will lock. I can't imagine how someone could be constantly squeezing a bar while pushing such a large stroller. Even my big strong brother had a hard time with it. In the end, my husband removed the bar and braking mechanism. Don't worry, you can still brake the stroller...in the back, there is a foot brake that locks the rear wheels when you step down on it...like normal. As it stands, I am happy with my purchase. I anticipated that this stroller would not be as fancy as the pricier strollers I have owned. Most importantly, because it actually fulfilled the purpose for which I bought it (folding up easily and fitting under an Egged bus) I am much more forgiving about the places where this stroller falls short. For the price, this stroller was an excellent value and a good functional stroller...and after buying it, I have not experienced any cravings to buy a triple stroller.